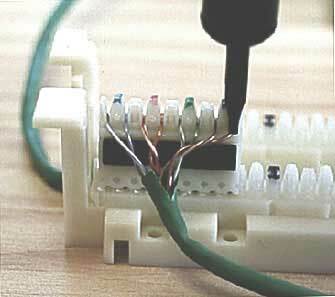 UTP cables are terminated with standard connectors (plugs and jacks) or punchdowns. 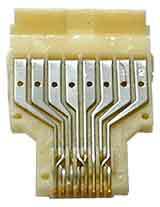 The plug/jack is often referred to as a "RJ-45", but that is really a telco designation for the "modular 8 pin connector" terminated with a USOC pinout used for telephones. The male connector on the end of a patchcord is called a "plug" and the receptacle on the wall outlet is a "jack." These terminations are called "IDC" for "insulation-displacement connections," since the wires are held in knife-edge terminations that slice through the insulation and dig into the copper wire, forming a tight seal like this. All IDC connections require untwisting a small amount of each pair to get the wires into the contacts. In order to minimize crosstalk and return loss problems, its necessary to keep the amount of wire in each pair untwisted and minimize the amount of cable jacket removed. For Cat 5/5e/6/6A cable, the maximum amount of untwisted wire is specified as 0.5" (13 mm) but it's good practice to minimize the amount of untwist and the length of cable jacket removed. In structured cabling as specified by TIA-568, there are two possible color codes or pinouts, called T568A and T568B which differ only in which color coded pairs are connected - pair 2 and 3 are reversed. Either work equally well, as long as you don't mix them! If you always use only one version, you're OK, but if you mix A and B in a cable run, you will get crossed pairs! While it makes no difference electrically which one you use, it is not wise to use both in one customer location. Always check to see which scheme has been used and continue using that one in new cabling installation. Each pair consists of a colored wire and a white wire with a matching color stripe. The stripe wire is "tip" and the solid color wire is "ring," referring to the tip of the old 1/4" telephone plug and the ring around the shaft that makes the connections. Note: Plugs/jacks and punchdowns have different color codes! You cannot mix them up as they will result in wiremap errors - esp. 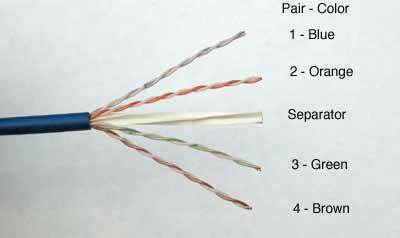 split pairs which cause big problems with high speed transmission. 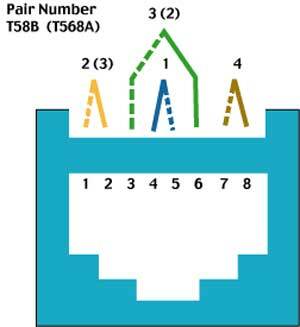 Note that the only difference between T568A and T568B is the reversal of pairs 2 and 3 - it's only a color code change. 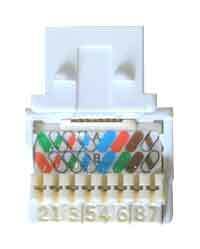 Note: Cat 3 jacks and all plugs are going to use these color codes shown above. 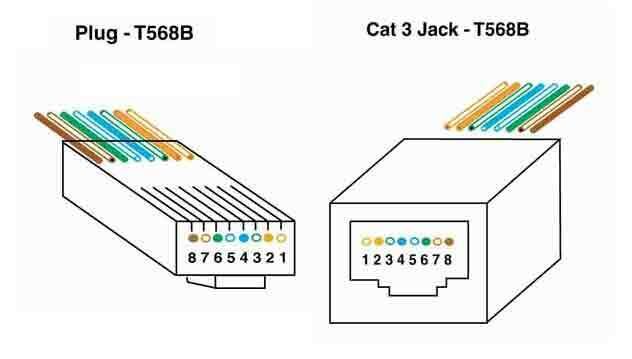 However, Cat 5, 5e and 6 jacks have internal connections that continue the twists as close to the pins in the jacks as possible to maintain the performance level. Thus the pinout on the back of the jacks will not usually follow the standard color code layouts- see the pin sequence in the photo above and the twists in the internal connections of the jack here! Remember: Always follow the color codes on the back of the jacks to insure proper connections! Jacks usually have 110-style punchdowns on the back which can be terminated with a punchdown tool, using special manufacturer's tools or even a snap-on cover for the connector. Again, you MUST keep the twists as close to the receptacle as possible to minimize crosstalk. Here is a virtual hands-on tutorial on terminating jacks. The plugs are terminated by straightening our the wires in proper order and crimping on a connector. 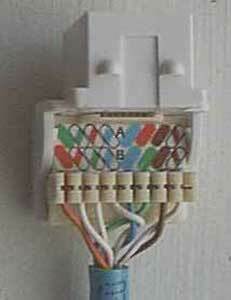 Like we said before, you MUST keep the twists as close to the plug as possible to minimize crosstalk. 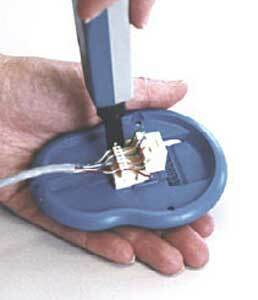 Here is a virtual hands-on tutorial on terminating plugs. They generally use stranded wire for flexibility but can be made with solid wire for higher performance. Note that plugs may be different for each type of wire, so make sure you have the right type. Crossover Cables: Normal cables that connect a PC/NIC card to a Hub are wired straight through. That is pin 1 is connected to pin 1, pin 2 to pin 2, etc. However, if you are simply connecting two PCs together without a hub, you need to use a crossover cable made by reversing pair 2 and 3 in the cable, the two pairs used for transmisson by Ethernet. 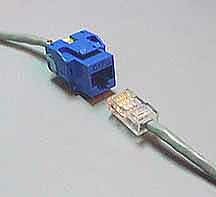 The easy way to make a crossover cable is to make one end to T568A color coding and the other end to T568B. Then the pairs will be reversed. Sometimes there are cross connects using punchdowns in the telecom closet, more common on telephone wires than data. These are called punchdowns because the cable is punched down into the IDC contacts with a special tool, called (surprise!) a punchdown tool. Of course, you MUST keep the twists as close to the punchdown as possible to minimize crosstalk. Punchdowns come in 4 varieties: 110, 66, Bix and Krone. Most popular for LAN interconnects is the 110 block. For telephone cables with large pair counts (25, 50, 100, etc. ), the 66 block is the most common. The Bix and Krone blocks are rarer proprietary designs (Bix from Northern Telecom, Krone from Krone in Germany) used mostly on the manufacturer's own installations. Here is a 110 block as used in LAN interconnects and on UTP jacks. The actual IDC contacts are in the connecting block that is punched down on the base, sandwiching one cable, then the second cable is punched down on the top. Here is a virtual hands-on tutorial on terminating 110 blocks. 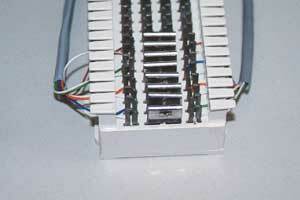 66 block as used for POTS (plain old telephone system) telephone systems. 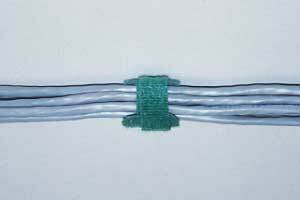 They are designed for interconnecting large pair count cables. There are four rows of punchdown IDC contacts. One cable is punched down on the outside row of contacts of each side then the two sides are connected using the inside rows of contacts. If connections are directly across, bridging clips can be used. 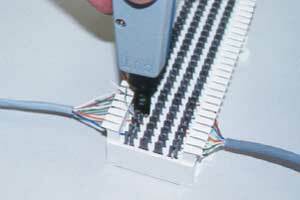 Otherwise, bridging wire is punched down on the correct contacts on each side to make connections. Here is a virtual hands-on tutorial on terminating 66 blocks. Punchdowns of all types are always made with the pairs in order with the white/stripe wire (tip) first, then the solid colored wire (ring). Refer to our online "virtual hands-on" explanation of the termination processes of Cat 3/5/5E/6 for complete illustrated procedures. Few installers make their own patchcords since they are available at very low cost and take considerable time to make in the field. About the only reasons to make patchcords is to create custom lengths to make cabling in the telecom room look neater or to make higher performance patchcords using solid wire cable as is installed in the permanent cable plant rather than lower performance stranded wire used for normal patchcords. Occasionally installers will terminate a cable in a plug to directly connect with hardware and avoid using patchpanels, jacks or patchcords. 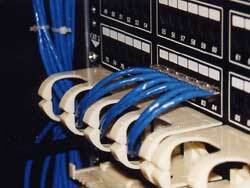 Patch panels offer the most flexibility in a telecom closet. All incoming wires are terminated to the back of the patch panel on 110-style punchdowns (again watching the 1/2 inch limit of untwisting pairs). Then patch cables are used to interconnect the cables by simply plugging into the proper jacks. Patch panels can have massive number of cables, so managing these cables can be quite a task in itself. It is important to keep all cables neatly bundled and labeled so they can be moved when necessary. However, it is also important to maintain the integrity of the cables, preventing kinking or bending in too small a radius which may adversely affect frequency performance. One should also avoid bundling the cables too tightly. Crushing the cables can affect the performance, since it can affect the twist and pair alignment in the cable which affects high frequency performance. If one uses regular plastic cable ties, they should be tightened only finger tight and cut off - do not use cable tie guns which may tighten tight enough to damage the cables. Preferably use "hook and loop" cable ties which have an added advantage that they can easily be opened to add or remove cables. Test your comprehension with the section quiz. Each page will open in a new window. UTP Cables, Power Over Ethernet. UTP Terminations, (Tutorial). UTP Termination. See the "Fiber Optic Technology and Standards" Section below for information on networks, etc.